First was LeBron James. Next was Dwyane Wade. 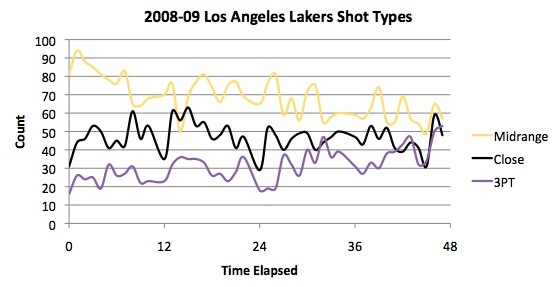 Today I’ll be looking at the shooting tendencies of Kobe Bryant. My methods will be the same as with the first two, so if you have any questions about how or why I do certain things, be sure to check out those first two articles. If you read my pieces about James and Wade, the first thing you’ll notice is that Bryant takes a lot more midrange shots and much fewer close shots than the other two. 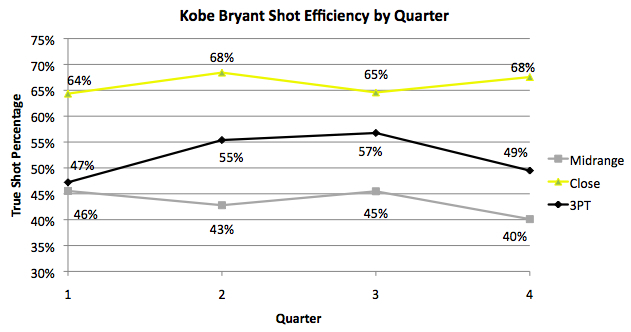 However, he does have one thing in common: as the game goes on, Kobe favors the three-ball more and more. Those shots make up just 11% of his attempts in the first quarter, but they double to 22% by the fourth. However, unlike the other two, these attempts do not come at the expense of close shots. Close shots do go down slightly, but Kobe also seems to make a concerted effort to get to the line as the game wears on, especially in the fourth quarter. 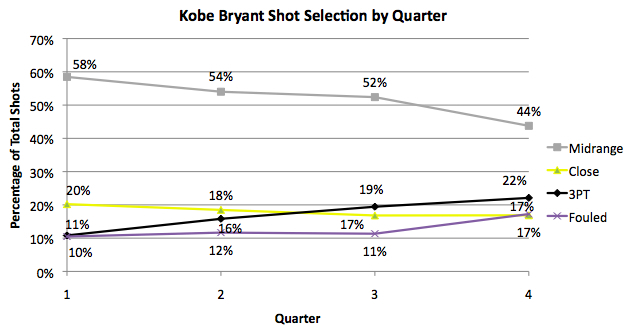 Instead, Bryant chooses to forgo midrange shots (which is a smart decision, as we will see later). Why is Bryant more relentless at taking it to the basket than James and Wade? Part of it could be a personal mentality, and part of it could be less fatigue. After all, the Lakers can offer much more offensive support for their superstar than the Cavaliers or the Heat. Whatever the reasons, Bryant is able to take more efficient shots (three-pointers) in the fourth than he does in the first. Like most players, Bryant has his ups and downs. However, I see three general trends: midrange efficiency decreases slightly, close efficiency increases slightly, and three-point efficiency peaks in the middle of the game. Still, at all times Bryant is more efficient from three than he is from midrange, so his shot selection trends seem to be wise decisions. I’d like to keep looking at individual players, but I may switch gears and look at a big man next. The results may be drastically different, so stay tuned. As you can see, I made one change from last time. For Wade, I included offensive possessions that resulted in him taking shots from the free throw line. The reason for this is that close shots might be underestimated because of the frequency that forays into the paint lead to fouls. Like James, as the game goes on, Wade increases his attempts from beyond the arc at the expense of close shots and a bit of midrange. Even if we assume every trip to the line came off a close attempt (which would be very questionable, especially considering non-shooting fouls that occur after the opposing team is over the limit), the trend is still the same. In the fourth quarter, Wade takes almost three times as many three-pointers as he does in the first. Like I suggested with LeBron, fatigue could be a factor, as could adjustments made by the opposing defense. Here we see a major difference between Wade and James. While the latter gets worse on three-pointers as the game goes on, the former gets better. Remember, that was the major concern with James. Despite it becoming a less efficient shot for him, James favors the three-pointer more and more as time elapses. 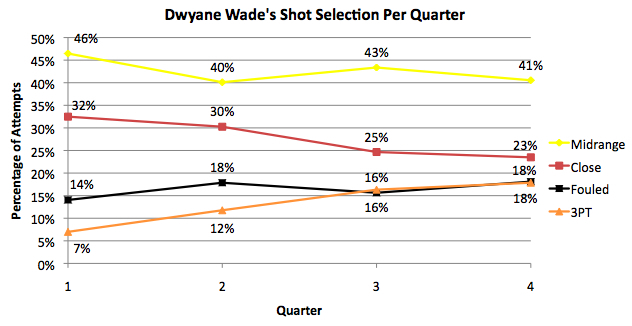 Wade gets much more accurate from long range, while his efficiencies in the other two shot types decrease slightly. This means his increase in three-point attempts makes more sense. 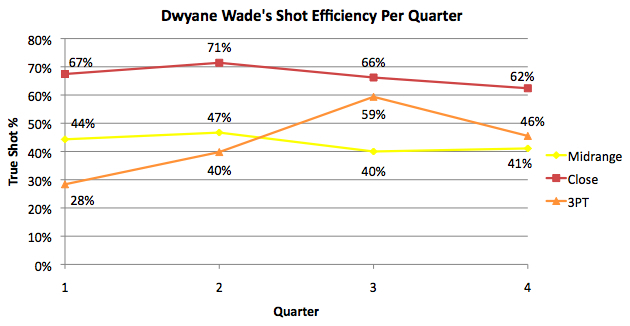 In fact, Wade is a pretty darn good three-point shooter in the third quarter. Can we try to optimize the shot selection for an NBA player? Nobody knows how to balance a player’s offensive game better than the player himself, so I don’t think we should try. Still, we see that LeBron’s in-game adjustments don’t seem to make sense like Wade’s do. Whatever the reasons, it appears the Heat do not suffer to the same extent as the Cavaliers (based on the individual performances of Wade and James alone). Now that I’ve explored shot types at the team level, it’s time to move on to a single player. What better player to look at than the league’s MVP, LeBron James? Using the play-by-play data at BasketballValue, I will explore how James changes his style of attack as the game progresses, and whether or not he optimizes his shot selection. Midrange shots (in terms of the way I define them) are the most common shot attempt in the game, so it’s no surprise that most of James’ shots come from this area. His preference for this type of shot stays consistent throughout the game. However, he’s no dummy, and he uses his size and athleticism to attack the rim early and often. Of course, when we compare these shots to three-point attempts, we notice a strange pattern. Despite being much more efficient on close attempts (more on this later), LeBron shies away from this type of shot as the game progresses and instead takes more threes. In the third quarter he actually takes slightly more three-pointers than close shots (remember, though, that shooting fouls are not included, so in actuality he probably still takes more close shots), before the numbers revert slightly back to normal in the fourth. Why would James do this? There are a number of factors that come into play. Fatigue would be my best guess. It’s clear to everyone in the building that James is a superstar, so he not only must carry the offensive load but also deal with opposing defenses that are focused on stopping him. It wouldn’t be shocking to find out that he settles for more outside shots as the game wears on simply because he doesn’t have the energy to keep taking the ball inside. Another possible reason is opposing coaches growing tired of his easy buckets and stopping at nothing to prevent those later in the game. The answer to my last question seems to be “no.” Not only is he much more efficient at close shots than three-pointers throughout the game (something any basketball fan could tell you), but he actually gets progressively worse on threes as the game goes on. In the first quarter, he’s quite efficient from long range, but by the end of the game he’s below average. Meanwhile, his efficiency from close range remains about the same. Yet for some reason, LeBron favors the three-ball more and more as the game progresses. Fatigue could be a factor again, and we also must consider the interaction between these shot types. James obviously must keep defenses honest, so abandoning the three completely despite it not being super-efficient would be a bad move. Still, I think there’s a lot to learn from all this. James is not shooting as efficiently in the fourth quarter as he is in the first. The question is whether it’s because of poor decision-making, fatigue, or defensive adjustments. Whatever the reason, it’s clear the Cavaliers would be better offensively if James could maintain his first quarter efficiency at all times. I’m going to look at the shooting styles of the Philadelphia 76ers in the same way I examined the Lakers. I chose the Sixers because they are one of the teams at the extreme ends of the spectrum– they attempted the second fewest three-pointers of any team in the league last season and converted those shots at the lowest rate. With the Lakers, we saw that close attempts and three-pointers were much more efficient than midrange shots, despite the latter being attempted the most. Will we find the same results with a team that struggled from long range? Here the data is much clearer. 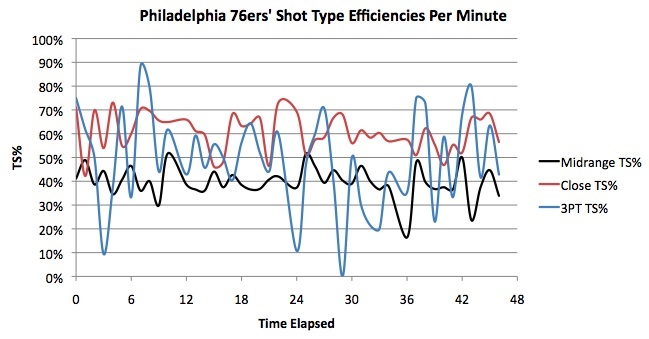 Just like with the Lakers, the most efficient shot for the Sixers is the close attempt. 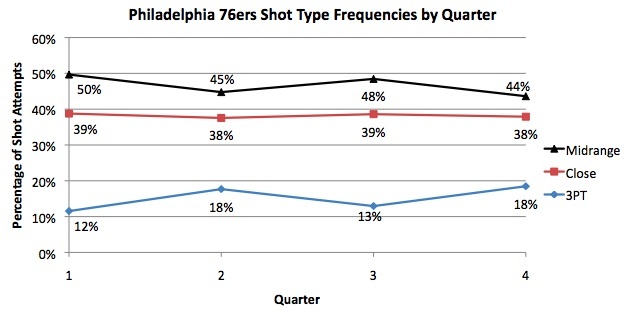 Also, despite a third quarter blip, and even though it is an obvious weakness of theirs, the Sixers are still much more efficient when shooting three-pointers than when shooting from midrange. In fact, in the fourth quarter, the long ball is almost as valuable for them as is the easy bucket around the rim. So what are the main differences between the Lakers and the 76ers? Basically, Los Angeles is more active and efficient from beyond the three-point line. This should not come as a surprise to many, as this is Philadelphia’s most obvious offensive weakness. However, what is surprising is that the two teams aren’t very different from midrange. Both favor that shot type the most despite it being their least efficient method. The Lakers are slightly more efficient from midrange, but that should come as no surprise considering they feature a dominant post player in Pau Gasol. 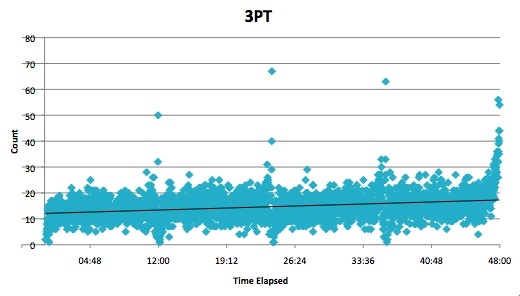 As we learned from my last study, there is a correlation between post attempts and three-point efficiency. Philly’s lack of a post presence last year and surrounding three-point marksmen may have been two of the biggest reasons their offense was not as great as the Lakers. With the return of Elton Brand and the arrival of Jason Kapono, things should improve slightly for the Sixers. But can it really be as simple as just taking more three-pointers? The graphs above suggest this, but the answer remains uncertain for now. Setting Up the Three: Which Shot Types Do the Best Job? Before I move on with more studies on team shot types, let’s take a brief look at shot optimization. As you can see from my Lakers study, L.A. takes a great deal of midrange shots despite it being their least efficient shot by a large margin. On the surface, that certainly seems like a suboptimal strategy. Perhaps, the thinking goes, midrange shots are efficient not because of how often they are converted but because of how they improve the conversion rates of other shots, namely three-pointers. If you mix up your shot types, teams have to respect each one and can’t just prevent three-pointers. Therefore, midrange shots improve the efficiency of three-pointers. As you can see, there is really no relationship. If we were to draw a trend line, it would actually have a negative slope (the original hypothesis suggests a positive slope). In addition, the p-value is .264, which means that slope is not even close to significant. Basically, there is nothing going on between those two variables. Although this isn’t a perfect representation of post shots, I think it’s the best we can do for now. And you can see we’ve got something going on here. The positive slope of the line has a p-value of .0682, making it significant at the .07 level. The R^2 is still very low, but there does appear to be some sort of positive correlation. The trend line doesn’t seem to fit the data very well. However, its negative slope turns out to be significant at the .1 level. This is heavily influenced by a couple of outliers, though, so I wouldn’t make too much of it. Regardless of whether or not the slope should be decidedly negative, it’s pretty clear it shouldn’t be positive. One explanation for this lack of correlation is that some players just can’t shoot three-pointers, so they instead take it to the basket. It’s not necessarily that inside shots don’t create openings on the outside. We don’t know for sure, and the fast break problem can’t be ignored. In reality, this is what we should expect. If you’re better at shooting threes, you’re going to shoot more of them. Therefore, the correlation is significantly positive. In conclusion, the biggest thing to take from this article is the lack of correlation between midrange frequency and three-point accuracy. However, when we narrow it down to shot types that are often taken from the post, there is something going on. Post shots, but not all midrange shots, set up threes well. Of course, none of this is a controlled experiment. It may be that teams with good post players intentionally go after good three-point shooters, so confusing the correlation with causation would be a big mistake. 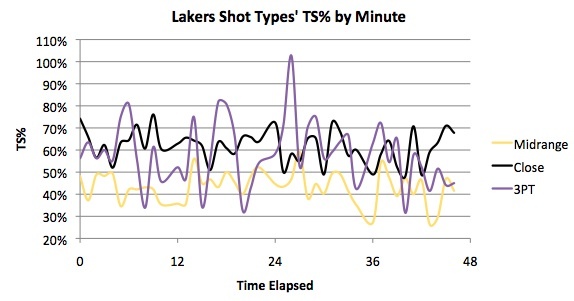 In my last article I took a look at how the Lakers mix up their shot attempts as games progress. After posting my results at the APBRmetrics board, a common request was take a look at the efficiency of these different shot types. Today, I will do just that using True Shot Percentage. This graph makes things much clearer. Again, midrange/post shots consistently give you the least bang for your buck (although we can’t ignore their hidden positive effects). For the Lakers, they are most efficient in the middle two quarters. Close range shots are the most efficient for the Lakers in every quarter except for the third, in which three-point attempts reign supreme. Of course, we can’t ignore the effects that each shot type may have on the others. The other significant trend is that, for the Lakers, all shot types are less efficient in the fourth quarter than they are in the first. Close range shots are consistently harder to convert, midrange shots rise then fall, and three-point shots bounce around pretty wildly. 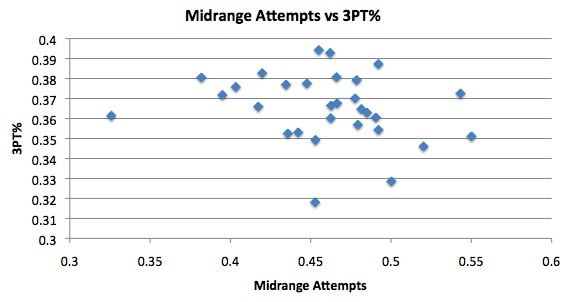 Midrange shots are the most common attempt throughout despite being the least efficient. I would imagine Lakers players and coaches aren’t stupid, so there must be hidden benefits to these attempts. However, it’s clear that as the game goes on the Lakers move from a less optimal shot type distribution to a more optimal one. Also, for what it’s worth, the decline in midrange shot attempts is smallest when they are shooting them the most efficiently. Meanwhile, the Lakers shoot three-pointers the best in the third quarter and consequentially have the highest increase in attempts in the fourth. The next step is to explore similar ideas with other teams, perhaps ones that are stylistically different than the Lakers. Also, it would be interesting to see these results for individual players. In my last article, I suggested that knowing how an individual team changes the way it attempts its shots as a game progresses might be a valuable piece of information. Today I will take a look at the Los Angeles Lakers. To study shot types at the team level instead of at the league level, I’ve made two changes. First, I’ve lumped the layup, dunk, tip, and putback categories into one called “Close.” This will make the sample size large enough to draw reasonable conclusions. Secondly, instead of totaling the Lakers’ amount of each shot type for every second, I will be doing it for every minute. This will make the graph look much smoother, too. Similar to the league-wide trend, the Lakers see their midrange/post attempts start high then decrease. They also see their three-point attempts start low then increase, and their close attempts stay at a consistent level. At the start of the game, it’s clear which shots they prefer. By the end, it’s much harder to tell. Also, coming out of halftime, the Lakers’ close shots spike first, followed by midrange shots, and then three-pointers. It wouldn’t surprise me if the Lakers coaching staff at the half emphasizes getting shots near the basket to start off the second half. This graph presents the data in a much clearer way. With this graph the shot counts are calculated per game. Here we can see that midrange shots consistently decrease throughout the game, while three-point shots have their biggest increases in the second and fourth quarters. 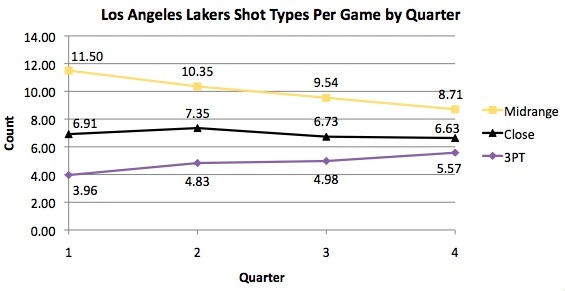 Overall, in terms of shot types, the Lakers don’t seem to be that unusual of a team. They start with a lot of midrange/post shots, but by the end of the game their attempts of three-pointers have almost caught up. Recently I explored how shot types change during the final two minutes of a game. 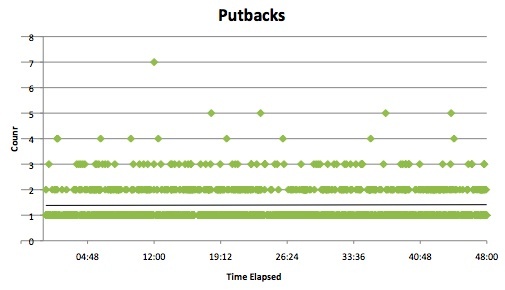 However, that only gave snapshots based on certain timeframes that I chose. Looking at how those shot types change, second by second, is much more enlightening. That is what I will be doing today. 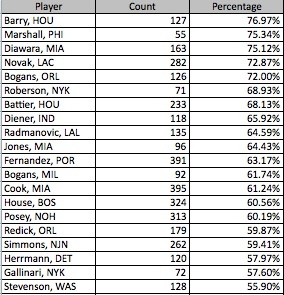 For each shot type, I will calculate the total amount of attempts from every game this year for each second. 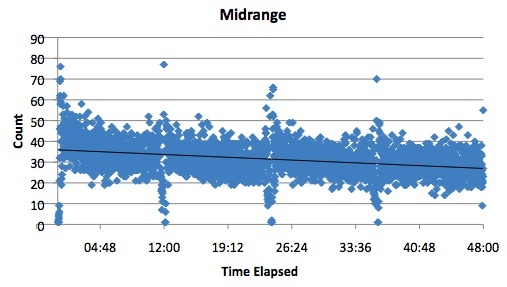 Outliers (which occurred at the end of each quarter) were removed from the graph for the sake of clarity. 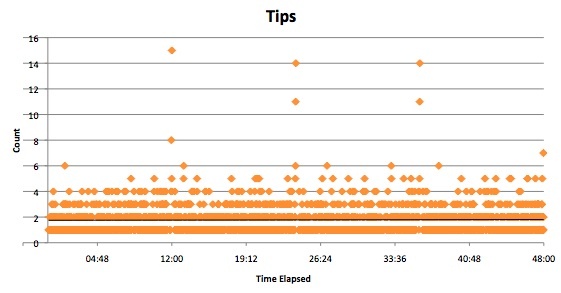 As you can see, there’s a significant increase in attempts as the game goes on. We also see a very rapid increase at the end of the game. I won’t speculate as to why this happens, but it certainly is interesting. Two-point shots away from the basket appear to do the opposite of three-pointers. They start at their highest frequency and gradually decrease as the game goes on. In the final moments the decline slows, but that is because all shot attempts, regardless of shot type, increase in the final seconds. Layups decline ever so slightly as the game progresses. At the start of the game the trendline is at around 17, and by the end it is just above 15. This difference is very small and can possibly be explained by one other change as the game progresses: fouls. 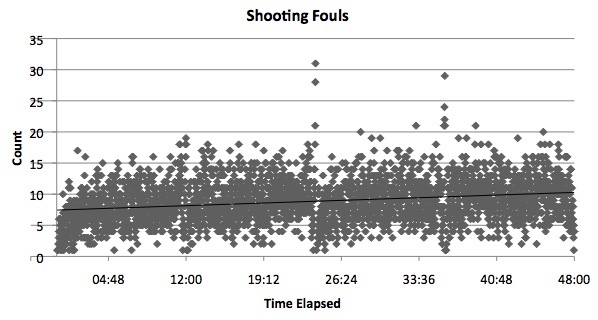 How do shooting fouls change over the course of a game? These fouls rise by about 2.5 during the 48 minutes, so it may be that layups just go down because shooting fouls (which will not show the shot type in the play-by-play) go up. We don’t know that most shooting fouls are on layup attempts, but outside shooters are rarely fouled and dunks, tips, and putbacks are infrequent enough to not be much of a factor. In conclusion, teams don’t move away from midrange/post and towards three-point shots only in the last two minutes. This appears to be a phenomenon that occurs from the very start of the game. Also, layups go down as the game progresses, but this may just be because of an increase in shooting fouls. Although this information is interesting at the league-wide level, it may be even more helpful on a team-by-team basis. If you knew how a certain team changes its style as the game progresses, it would be easier to game plan for them. This is something I will look into studying in the future. How Do Shot Attempts Change in the Last Two Minutes? 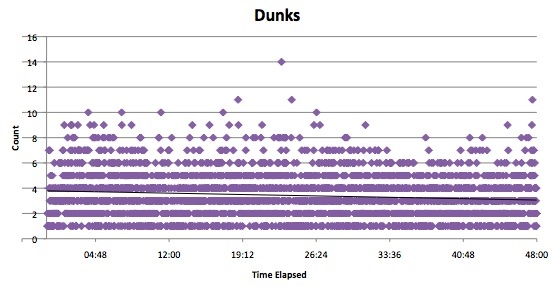 Using the play-by-play data at BasketballValue, I decided to see how shot attempts change in crunch time. Do players take more three-pointers in the last two minutes of a game? 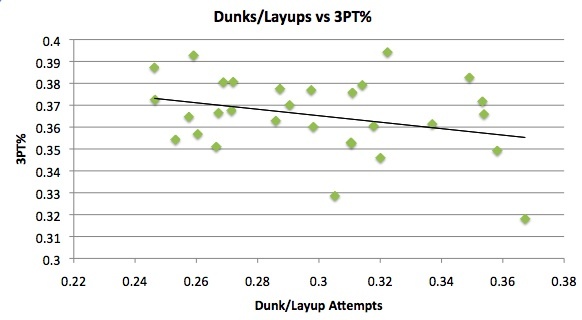 Are layups and dunks harder to come by? Does desperation lead to more players crashing the offensive boards and tipping the ball in? Today I’ll try to answer some of those questions. As you can see, essentially nothing changes except for two types: three-pointers and midrange/post shots. It appears teams take more long distance shots at the expense of less efficient and perhaps more difficult midrange shots. Logically, this makes sense, especially when your team is trailing and every point appears to matter more. If you’re down seven or eight points with little time left, you’re more likely to try to make up that difference in larger chunks. 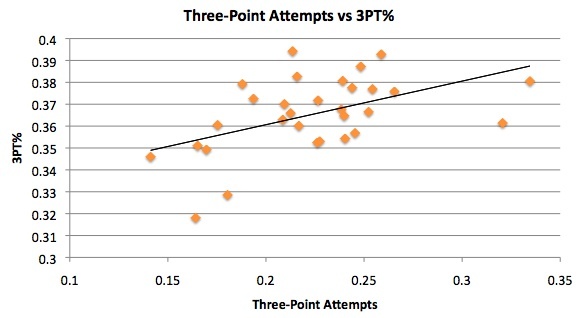 Also, perhaps players know that on average three-point shots tend to be more efficient than long twos. With the game on the line, they want to maximize their chances of having a productive possession. There are a number of problems to consider when looking at this data, and today I’ll take a look at one of them. Perhaps three point attempts only are high in the final seconds, when there simply isn’t enough time to get a shot off near the basket. There are only thee shot types that have enough attempts in each timeframe to qualify: three-pointers, layups, and midrange shots. As a general rule, with the game winding down, three-point attempts increase, layups decrease, and midrange shots bounce around a bit but also generally decrease. 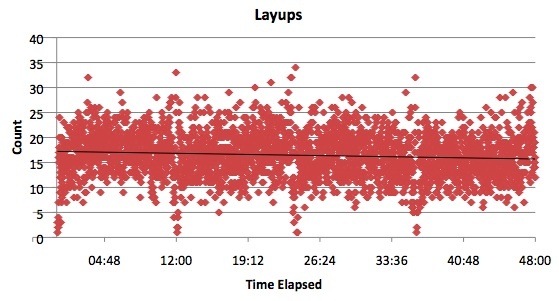 When I didn’t split the final two minutes into chunks, it appeared layups did not decrease. However, you can see that defenses tighten up on the inside as time runs out. The only reason I can think of for why midrange shots spike in the last five seconds is because players don’t have time to get any closer. There are also a lot of players like Dwyane Wade who will run the clock down to the final seconds and launch a midrange jumper at the buzzer. The next thing to consider is the situation in which these shots were taken. Narrowing it down to five-second intervals is nice, but it would be a lot more useful if we also knew the score and exactly how much time is remaining during each shot attempt. That is something I will take a look at in the future. 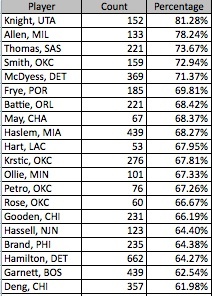 In my last article I took a look at some of the league’s leaders in various “easy buckets” categories. In other words, I found the players who had the strongest tendencies towards certain types of shots. Today I will do the same thing with outside shots. Brevin Knight is small, even for a point guard, so it’s not shocking to see him top this list. The top 20 includes a mix of big and small guys. There are little point guards like Knight and Jason Hart, swingmen such as Richard Hamilton and Luol Deng, and plenty of big men. We see a lot of names you would expect. Guys like Donyell Marshall make their living with the long distance shot and the numbers reflect that. Dirk Nowitzki is the leader of the pack by a wide margin. His tendency to fade away along with his height make his jump shot nearly impossible to block. The same can be said for Jermaine O’Neal and LaMarcus Aldridge, who also appear on this list. Most of the players on this list are point guards, who often have to float the ball over the outstretched arms of interior defenders in order to avoid having their shots blocked. Mike Taylor appears to be particularly fond of this shot. A few undersized big men such as Craig Smith and Antawn Jamison appear on this list as well. It’s no surprise Tim Duncan likes to face up his man on the post and use the glass. His bank shot rate is considerably higher than Shaquille O’Neal’s, who has the second highest rate. Either the Phoenix scorekeeper is confused about what a bank shot is, or the Suns teach their players to use the backboard often, because they have seven of the 20 players on this list. If you’re guarding Dwight Howard, be ready for the hook shot. Over 30% of his many field goal attempts are hooks. The Big Cat is not far behind at 29.01%. 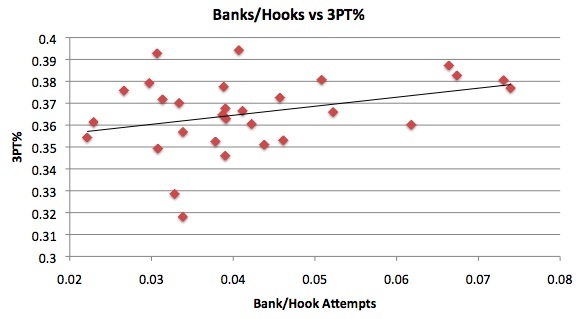 As you can see, the hook shot is a relatively common mode of attack for many big men.